This bug gets its name from its coppery-brown color. 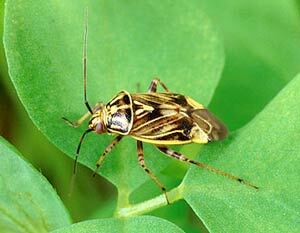 It is a major pest, especially for commercial growers. The list of favorite hosts reads like a catalog of major crops: apples and cotton to flowers and vegetables. In other words, if it grows and you want it, tarnished plant bug probably does too. It's a pest throughout most of North America. Nymphs are the more destructive stage. As they feed they inject a toxin into the plant tissue that stunts or otherwise deforms growth. These sleek insects move very quickly, and adults fly when disturbed. Adults and nymphs overwinter in weedy patches and organic debris, emerging in late spring to feed on young weeds and grasses before moving to favored crops. As with so many pests, control begins with a tidy garden: Keep the garden area free of weeds, and remove organic debris from the garden at the end of the season. Use a lightweight fabric row cover to protect plants, but remove it from fruiting crops during bloom to allow access to pollinating insects. Encourage natural enemies such as ladybugs, spiders, parasitic wasps, birds, and toads. For more specific measures to control serious outbreaks, check with your cooperative extension agent.